You may have heard of the “gold standard,” but it seems that a type of online currency is making a bid for supremacy in the financial world. Reports yesterday indicate that the price of one bitcoin surpassed the price of one ounce of gold for the first time ever. While both are considered “alternative assets” by the financial community, it gives some credence to past claims that the online currency might one day reign supreme for investors. For those who don’t know, bitcoin is a type of digital currency that consumers hold electronically. However, unlike other forms of currency, it is sent from one entity to another and is not controlled by a central source, like a bank. The cryptocurrency has a number of advantages, which consumers can learn about in the video below. However, due to the anonymity associated with its trading, it has also been used for a number of scams and illicit activities. While the value of bitcoin has gone up and down since it was introduced to the market, its recent increase in value may indicate that investors are taking it more seriously. Currently, traders of the currency are awaiting an SEC decision that would allow Winklevoss Bitcoin ETF to become the first bitcoin exchange-traded fund (ETF) in the U.S. market. 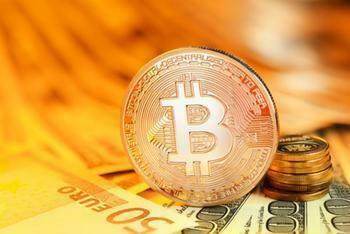 The ruling, which is set to be announced on March 11, would open the digital currency to a wider range of investors. However, some analysts have said that the bitcoin ETF has less than a 25% chance of being approved, according to an earlier CoinDesk report. As of Friday morning, gold had once again climbed back over bitcoin in value; one bitcoin was selling for $1,284.58, while one ounce of gold was selling for $1,319.60.